We had the most beautiful harvest festival assembly this morning. Staff and parents were brought to tears by the stunning performances from all the children. We began with Conker Class singing Cauliflowers fluffy. They used pictures and musical instruments while they performed and it was delightful. Up next, was Acorn class singing ‘Our God is a great big God’. They sang it A Cappella with minimal help from the teachers and every child knew every single word. Mrs Hallam had supported the Year 1 children to learn a poem. They learnt it off by heart and spoke with such clear, loud voices; it was so impressive. It was party time next, with Holly Class singing and dancing along to the Harvest Samba! It was such fun and you could see how much the children enjoyed performing it. We then had Cherry class sing ‘Oh how I need you’. This performance gave me Goosebumps because it was just so beautiful. To end we had Mr Garcia from DaCapo perform a song the children have been learning in music lessons about Autumn. They did this 4 times, each time performing it differently with Dominika accompanying them on the violin. We also performed our assembly song of ‘Our Hope is in the Lord’. David Booker led us in prayer and made us think about the importance of our Harvest donations. They are all going to help a local food bank to help people who are not as fortunate as we are. Thank you parents for all your generous donations and for supporting us with this event. It was fantastic to see your support and we really appreciate it. 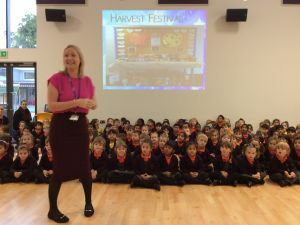 To view photos of the harvest festival assembly, please visit the Image Gallery section on our website by clicking here. Have a wonderful half term everybody!